Wirt County is employing many tactics to try to cultivate a more compassionate, learning-ready environment; among them: the Whole Child Health Project. The state faces complex ripple effects as a result of the opioid crisis. Among them, educators anecdotally report suspension rate increases in kindergarten classes, and a generation of babies born dependent on substances now being introduced to Head Start programs throughout the region. Public school teachers and staff staged a statewide walk-in earlier this year to bring attention to what they say is a dire need for in-school mental health support. 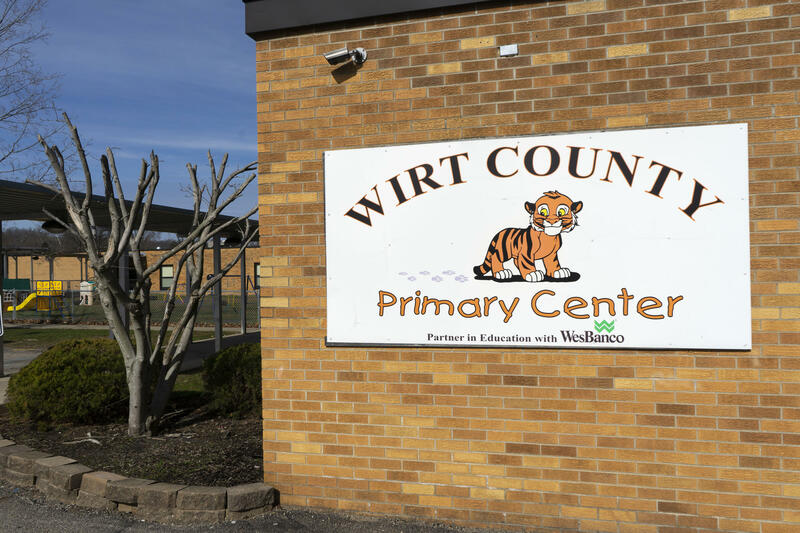 Many counties have already mobilized efforts to support students and help teachers who are not trained to cope with the increased number of traumatized youths disrupting the learning environment, including Wirt County. Jamie Vannoy has been teaching kindergarten class here for seven years. She’s having to learn how to cope with disruptive students who appear to have underdeveloped emotional coping mechanisms -- a classic symptom of trauma. She's not alone. The West Virginia Department of Health and Human Resources, and the West Virginia United Caucus describe similar stories, including accounts of housing insecurity. According to Wirt County Schools superintendent Mary Jane Pope Albin, 14.6 percent of the student body in her county is considered homeless by federal standards. “Meaning they were living family groups, living with other families, living with grandparents -- living outside of a traditional home,” Albin said. Wirt Elementary principal Melissa Emerson explained that trauma can affect brain development, and as a result, students might have difficulty understanding fundamental concepts like cause and effect. Wirt County's elementary school has been a regular home to supportive counselors - master's-level students getting a degree in therapy or social work. Educators are rarely experts in behavioral health, though. To adapt, Wirt County applied for and received a $50,000 grant last year from Sisters Health Foundation to fund implementation of a pilot mental health intervention called the Whole Child Health Project. The grant pays for a partnership venture with the nonprofit Harmony Mental Health. Bush was among the founders of the state’s Handle with Care initiative, which has worked to implement best-practice coping strategies in schools where students are dealing with a lot of trauma. Bush created a pilot program tailored to the needs of Wirt County designed to support kids, health professionals, teachers, school staff, and also graduate students pursuing degrees in social work or therapy. Harmony couples licensed health professionals with master’s-level students in schools. Bush says this model will help a new generation of therapists gain practical, paid experience providing trauma-informed care. 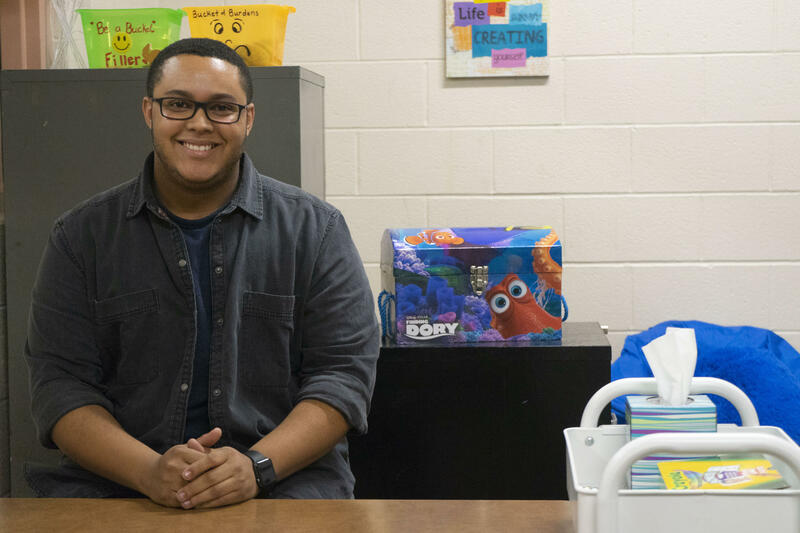 Tyler Davis is working toward his master's degree in social work through Concord University. He meets with students three days a week at Wirt Primary Center in Elizabeth, West Virginia. Tyler Davis is one such student. He's pursuing a master’s degree in social work online through Concord University. He and another masters-level student work here three days a week as “supportive counselors.” They have an office in the school library. 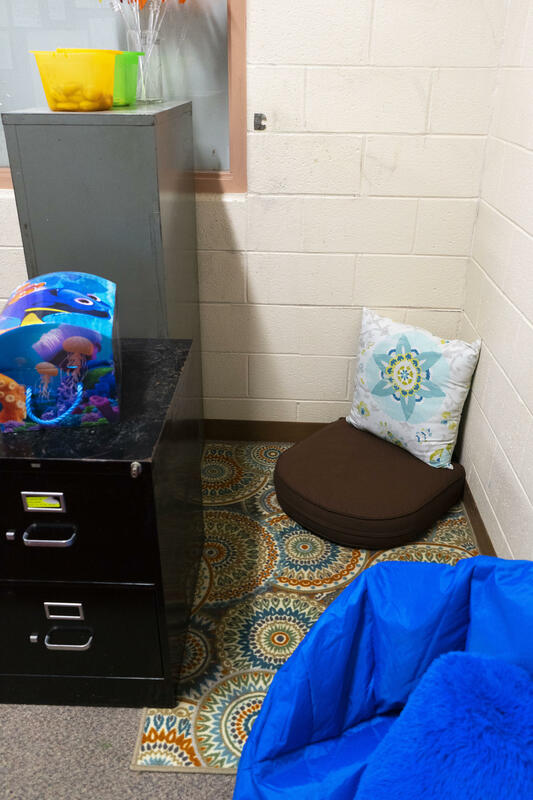 A corner of the tidy space has a hidey spot for kids who need a momentary escape, and games that help identify emotions and life-coping strategies. “We have pictures and activities and games and fun seating and a small table for working with little kids and color and stuff, and paint and all that kind of stuff. Kids love the room. We love it, too,” Davis said. Davis keeps a flexible schedule with kids who are signed up to receive therapy, and also kids who slip through official channels but demonstrate a need for extra attention. As a so-called “supportive counselor,” Davis’s role is largely to be there for kids who become dysregulated. He also works with teachers and school counselors offering expertise in helping kids who struggle with trauma. And he gets to work with parents, too. “It brings all aspects of their life together. looking at the child as the whole child and not just, you know, the school child and not just the client,” Davis said. Superintendent Albin explains that the program provides families access to mental health services that would otherwise not be accessible to the community. Wirt County is applying for additional grants to continue to program next year, but Superintendent Albin hopes legislation will be passed to increase access and funding for mental health services in schools. “I am really hoping that our sustainability will be a natural sustainability through state funding,” Albin said. Superintendent Albin says it's too early to draw conclusions, but she's optimistic. She says academic academic achievement has improved this year and that they’ve seen fewer disciplinary actions. Albin says these and other data will be collected and analyzed to monitor progress of this and other actions the county is implementing. On this West Virginia Morning, the Kaiser Family Foundation published an analysis this week that found Affordable Care Act marketplace premiums are least affordable for middle-income older adults. And some of the highest premiums in the country are in rural areas like West Virginia. Kara Lofton spoke with Cynthia Cox, one of the authors of the analysis, about the findings.